What’s good about it? THE PREMISE! Cinderella as a cyborg?! Brilliant!!! Genius idea! 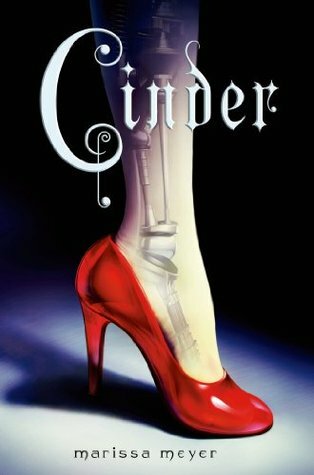 There’s a lot to love here – Cinder is a great main character who felt more real to me than Cinderella ever had done (except for maybe in the film Ever After with Drew Barrymore – that was a good film :D). From her relationship with Iko (the most human robot ever, seriously, sometimes I forgot she was a robot and then couldn’t work out why she didn’t have hands) to that of her adoptive family it all felt rich and real. I liked that ‘the evil stepmother’ had a little more depth than you usually find. Her reasons for hating Cinder were pretty clear cut and given society’s view on cyborgs…I could see why she hated her. It wasn’t a superficial hatred like you sometimes find. I thought the Letumosis disease was well done – it was woven in throughout and didn’t feel like a plot point that was just dropped and picked up when convenient. There was genuine danger there that I felt was almost always present. What’s bad about it? So there’s this one twist, that I couldn’t work out if we were supposed to be in on it from almost the get-go or if we were supposed to be surprised by it. I wasn’t surprised by it and I felt that it couldn’t have been more obvious if it was dancing naked in front of me. So I’m torn here, could go either way. The verdict? I thought this was great. I loved that it was such a fresh new take on the Cinderella story keeping just enough of the common elements and twisting others – the new version of the glass slipper (as such) was ingenious! I loved the setting with it’s quirks and intolerances and people just trying to live their lives. The Letumosis disease felt like a tangible threat to the population and Queen Levana was delightfully twisted – although I do think there’s more to be seen of her character (some parts felt a little surface level) but I figure this will come out in the next few books. All in all it was a highly enjoyable read! Now onto the sequel, Scarlet.